Growth hormone/IGF-1 axis longitudinal evaluation in clinically isolated syndrome patients on interferon β-1b therapy: stimulation tests and correlations with clinical and radiological conversion to multiple sclerosis. Lanzillo R, Di Somma C, Quarantelli M, Carotenuto A, Pivonello C, Moccia M, Cianflone A, Marsili A, Puorro G, Saccà F, Russo CV, De Luca Picione C, Ausiello F, Colao A, Brescia Morra V.
Growth hormone (GH)/insulin-like growth factor 1 (IGF-1) axis abnormalities in multiple sclerosis (MS) suggest their role in its pathogenesis. Interferon β (IFN-β) efficacy could be mediated also by an increase of IGF-1 levels. A 2-year longitudinal study was performed to estimate the prevalence of GH and/or IGF-1 deficiency in clinically isolated syndrome (CIS) patients and their correlation with conversion to MS in IFN treated patients. Clinical and demographic features of CIS patients were collected before the start of IFN-β-1b. IGF-1 levels and GH response after arginine and GH releasing hormone + arginine stimulation tests were assessed. Clinical and magnetic resonance imaging evaluations were performed at baseline, 1 year and 2 years. Thirty CIS patients (24 female) were enrolled. At baseline, four patients (13%) showed a hypothalamic GH deficiency (GHD), whilst no one had a pituitary GHD. Baseline demographic, clinical and radiological data were not related to GHD, whilst IGF-1 levels were inversely related to age (P < 0.001) and GH levels (P = 0.03). GH and IGF-1 serum mean levels were not significantly modified after 1 and 2 years of treatment in the whole group, although 3/4 GHD patients experienced a normalization of GH levels, whilst one dropped out. After 2 years of treatment 13/28 (46%) patients converted to MS. The presence of GHD and GH and IGF-1 levels were not predictive of relapses, new T2 lesions or conversion occurrence. Growth hormone/IGF-1 axis function was found to be frequently altered in CIS patients, but this was not related to MS conversion. Patients experienced an improvement of GHD during IFN therapy. Longer follow-up is necessary to assess its impact on disease progression. The human brain has all the systems known to man rolled into one. Over the years we have challenged our long held belief that the brain is an immune privileged site (we now know that B cell follicles exist and that lymphocytes frequently enter the brain), that it doesn’t have a lymphatic system (there is now the so-called glymphatic system! ), and last but not least that the endocrine system plays a very small part in brain disorders (mostly because very few researchers have investigated it). It would have been largely OK to proceed in this usual oblivious fashion, except we know that MS affects every bit of the brain. It therefore comes as no surprise that Lanzillo et al report that 13% PwMS (4 out of 30) have hypothalamic dysfunction. The release of growth hormone (responsible for growth) from the pituitary gland in the brain is stimulated by growth hormone releasing hormone from the hypothalamus. 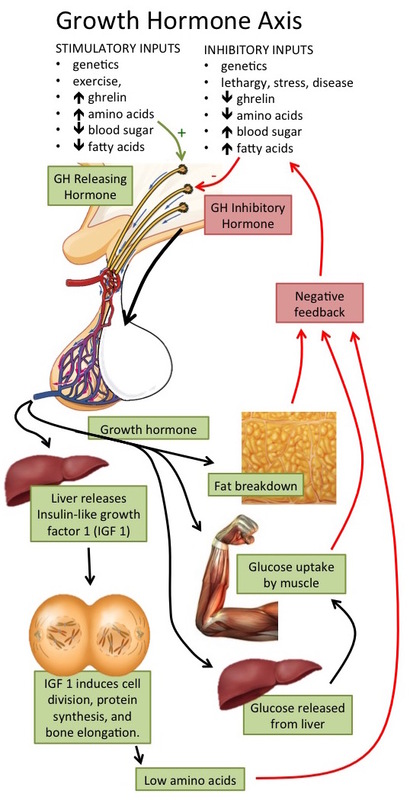 Growth hormone stimulates IGF-1 secretion from the liver, which is produced throughout life, but the highest rates occur during puberty coinciding with the growth spurt. Both growth hormone and IGF-1 have been reported to stimulate myelination. In MS cross-sectional studies, low avilability of growth hormone have been linked to greater disability and may therefore affect long-term prognosis. Although this has not been studied over the long-term (i.e. in a longitudinal fashion). This is what Lanzillo et al. have done. In addition, they also examined the effect of interferon treatment, since there is some evidence that it may boost IGF-1. They found that in everyone who participated, their growth hormone deficiency improved at 1 year follow-up. Since there was no comparator arm in this study, you cannot say that the improvement was solely related to interferon treatment. However, they did find that 46% of people developed clinically definite MS, which was unrelated to either their growth hormone or IGF-1 levels. The significance of growth hormone deficiency in MS is therefore unclear. Whether the relationship is one of cause or effect is even less certain, in spite of previously reported cross-sectional studies. That is, it is not known whether low levels of growth hormone influence the development of the first demyelinating event, or is caused by it. I would be interested also to find out what happens to the rest of the hormones during the course of MS, for example, thyroid, cortisol, and gonadotrophin levels? I had secondary hypothalamic amenorrhea (exercise and diet induced) in my 20s. Recovered at 30 then was diagnosed with ms a year later. Coincidence? NDG when I researched about the dosage of vitamin D to take, right after I was diagnosed with MS, I did read about a possible relationship between vitamin D and IGF-1 levels influencing the overall level of growth hormone. So does this relationship exist, which would also allow us to be more exposed to viral and bacterial infections, which could be "triggers" for the disease? The hormones and the relationship with MS make me intrigued, especially the gender relationship that the disease presents. Yes vitamin D does boost IGF-1 levels probably acting in the liver, as this is can happen even in those with growth hormone deficiency. Whether this makes us susceptible to infections is a question to be answered. A lot of the work you refer to as far as hormones goes in women is with oestradiol and the risk of MS in women. This work is looking at the production of IGF 1 by lymphocytes following alemtuzumab, the same happens after IFN B. These cells process IGF 1 receptors on their cells surfaces and their number decrease as they differentiate into different cell types. On balance, IGF signalling in these cells is responsible therefore for their differentiation and proliferation. When the researchers measured this production by the PBMCs they were probably measuring this and self-autoregulation in these cells rather than gross IGF 1 production! The authors speculate on this in the discussion. Thanks for the clarification, Neuro Doc!